Fifty days of tough rehabilitation following a spinal cord injury at age 32….only a week till discharge. My doctor tells me that the metal brace can come off and YES I can go water skiing on Tuesday. My Recreation Therapist, Carol Huserik has arranged for this special outing. I ready myself for the early morning bus ride to Boulder Reservoir on the activity bus. We leave at 0600 sharp for the 40 mile road trip.When we arrive, the lake is picture perfect still, no ripples of wind. Helpers all around help me prep: dressed only in shorts and t-shirt, neoprene booties, a life vest snug and secure….a short roll down the steep ramp to the gently bouncing, floating dock. The special waterski waits: a plastic one-piece office chair bolted to two wide water skis and a pull rope attached to the ski boat. An appropriate ski for a new paraplegic from Craig Hospital. 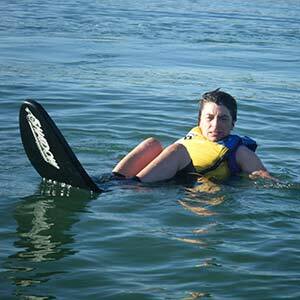 I transfer from wheelchair to waterski…..then slowly lowered into the water, brisk and cold. Steady and ready in the water as the boat bobs, the driver waits for my shout…. I am ready, still as can be on the rippling water and shout “hit it”. The boat bolts forward, gains in speed. The makeshift waterski gains momentum and we rise out of in the water. I am waterskiing!! The feel of the morning air and cold water spray wake me up and off we go for laps around the reservoir. I called this outing my ‘claim to fame’ to be waterskiing even before discharge from the rehab hospital. I continued waterskiing with the Boulder Expand Program for over twenty years. Over the years, my skills increased leading to less cumbersome equipment. I held my own rope for take-offs and many times didn’t need the assistance of the chase boat to get back up. My goal was to complete two laps of the reservoir, make a perfect drop at the dock and be back on deck with my hair still dry. Waterskiing wasn’t just waterskiing. It was an opportunity to work through many of the difficult struggles associated with a spinal cord injury. The challenge of timing the “hit it” while remaining steady in the water; handling the deep wake rollers; coming back week after week to gain the strength and confidence of this sport. So many times I’d take my life frustrations out on the lake, slapping the water in anger, and working through untold issues of living with a disability. I somehow knew if I could handle the rough waters on Boulder Reservoir, I could handle the stresses of just about anything else including three graduate degrees. I am forever grateful to the Boulder Expand Program for providing this life supporting opportunity. The volunteers on the shore and boat dock; boat drivers and chase crews and other skiing participants who helped all of us achieve the remarkable!